As head of SGPC Jathedar Gurcharan Singh Tohra has a responsibility to run the religious affairs in accordance with the Sikh Code. B.S.Goraya has strong allegations on the conduct of this respected politician and he believes that the Jathedar has deliberately violated the Akal Takhat Hukamnama, changed the colour of Sikh Flag from yellow lo saffron and allowed decline and decay in the faith values. Jathedar Tohra has now completed 22 years as head of the Sikh apex institution the SGPC. His tenure as head will be known as one of the dark periods in the institutional history. It saw the mushroom growth of self styled Sikh saints. He acquiesced the occupation of Golden Temple Complex first by militants and consequently demolition of Akal Takhat at the hands of Indian Army, and damage and desecration of Golden Temple. He failed to carry any missionary activities despite availability of hundreds bf crores of funds, as a result of which the Sikh youth is today deranged and most misled, fully drowned in liqour and drugs. The most conclusive evidence of his in acivity and clandestineness is that the Sikh standard the Nishan Sahib has been altered without any authority. His violation of Nirankaris edict has rather too becomes too well known. Jathedar Tohra is not at all religious and his sole aim is to occupy the chair of CM and has become more active in view of rumours of ill health of Mr.Badal, and that he is doing so to please the forces which are bent upon absorbing Sikhism and during his tenure the growth of Sikhism touched the lowest ebb in the history. There are about 300 so called saints / gurus/ deras who claim that their teachings do not differ with that of Guru Nanak.' however they refuse to fully comply with the mainstream accepted Sikh Code of Conduct the Rahitmaryada: Nirankari is one such sect. The Nirankaries, however, go a little step ahead and claim that their head is the God himself. Though rest of the sects are gathering their numbers peacefully. 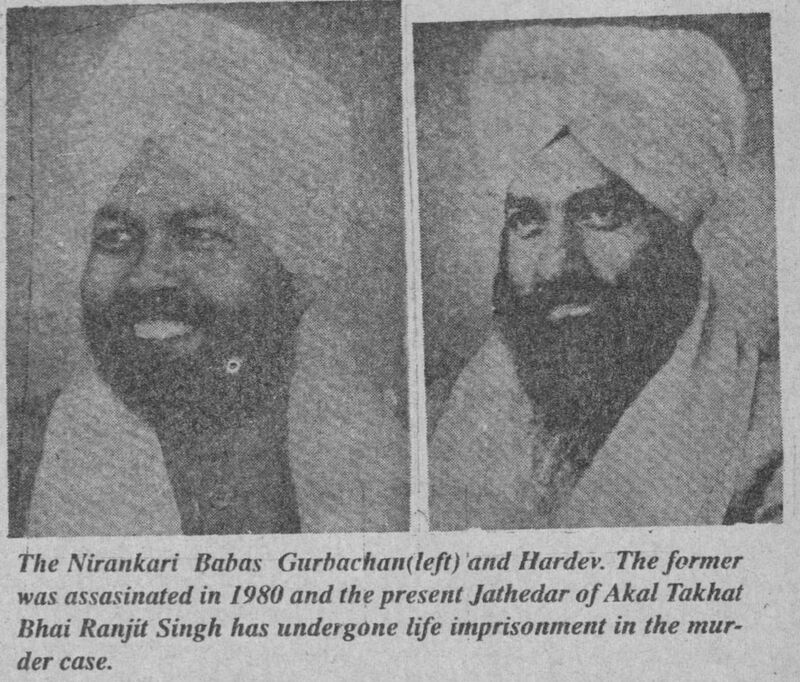 The Nirankaries, came head on the Sikh mainstream. 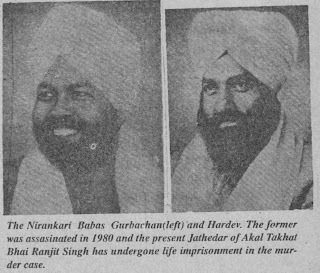 ln 1978 the Nirankaries the killed more than a dozen Sikhs in Amritiar who had gone to protest against their preachings. Accordingly the Akal Takhat had then issued and edict ordering social and religious boycott of the Nirankaris. Though the successive Congress Govts have all along decreed against the issue of such edicts which have otherwise been very effective. With the issue edict the hukamnama the growth of Nirankaris among Sikhs has declined. In the last election Mr.Chandumaira a close lieutenant of Mr. Tohra was s a candidate ftom Patiala. Mr. Tohra nourishes his separate group in the Akali Dal and endeavours to secure maximum tickets for his group people in the elections thus depriving Badal a free hand in elections. Tohras canvassing is confined to the candidates of his group alone. It is now a known fact that Mr.Tohra visited the Sant Nirankari Bhawan at Patiala and appealed them to support his candiddate Chandumajra. During his statements to the press Mr.Tohra has not denied his visit to the Nirankaris. Speaking to press on April 11 he said that during elections the political parties made appeals to all sections of people, and that he had appealed to all sections and sects including Nirankaris. He further questioaed “What was wrong in it ? " He thus justified his visit to the Nirankaris. The reports on the following day appeared in the' press which he did not deny. Captain Amrinder Singh the successor of Sikh state of Patiala, who won that election approached Akal Takhat Jathedar demanding that the boycott of the Nirankaris be lifted since the head of SGPC who appoints the Jathedar of Akal Takhat has initiated social interaction with the Nirankaris. There was thus no justification in continuing the ban on them. Amrinder though himself a Congressite Sikh was otherwise justified to claim that the boycott was lifted. In any case it was then Mr.Tohra a gross misconduct and violation of the Hukamnama himself stood proved. Any way now he is busy alleging the Congressite Sikhs that since they had been ignoring the Hukamnamas, they are not morally justified in criticizing him. This like one convict telling the other convict that both of them have committed a crime and thus it is no crime. 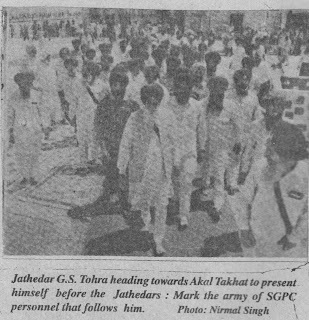 ln view of Amrinder's letter and public outcry Mr.Tohra appeared at the Akal Takhat, the supreme institution of the Sikhs which has got the authority to issue such edicts. Surprisingly he was accompanied by the officials of the SGPC who are under his own control. During his submission before the Sikh clergy he ensured that the press was not allowed inside. Now when it has become as clear as the day light that Mr.Tohra visited the Nirankaris, the jathedar of Akal Takhat differed the issue and on the contrary insisted on some concrete evidences from Amrinder in his allegation that Mr.Tohra has visited the Nirankaris. lt is somewhat sarcastic that the Jathedar has insisted for proof of the allegation for which the accused has not challenged the allegation. The behaviour of the Takhat Chief is also not above board; Only a few months ago the Takhat chief was helped by Tohra otherwise he would have been behind the bars in Tihar Jail of Delhi. lt was like ' I scratched your back, now Mr.Ranjit Singh the Takhat Chief should scratch mine'. His impartiality would now be known. The Takhat Chief has adjoured the case upto May 9, 1998. On the other hand Tohra’s supporters are coming up with strange arguments in his defence. One such supporter Mr Jasbir Singh Ahluwalia'of Guru Gobind Singh foundation has argued that the Tohra's action does not amount to the violation. He is also of the same category as Jaspal Singh who was exposed in the last issue of Punjab Monitor. There however is justification in the demand of such politicians who say that Tohra should first resign the post of SGPC chief prior to his'appearance before the Takhat. His trial, if he continues to be the head of SGPC, can't be fair. There is another charge that Mr.Tohra has accepted the robe of honour i.e.Siropa from Nirankaris during his visit to them. ln case it is proved then the survival of Mr.Tohra wil becorne utterly impossible. lf he had accepted the siropa, that would mean that he had accepted their supremacy. Things will become dfficult if Mr.Chandumajra had also accepted the siropa from Nirankaris. Why did Tohra do it ? It is almost certain that Mr.Tohra visited the Nirankari gathering at Patiala. It can't be an act through oversight but is a delibrate attempt. 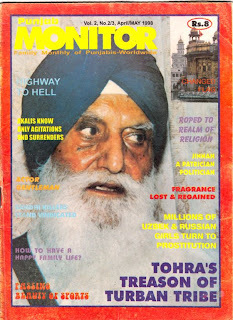 Mr.Tohra was otherwise treated as religious fanatic by the Hindu voters of Punjab. On the other hand Mr.Parkash Singh Badal had been adopting a neutral policy as far as the religion is concerned. Mr.Tohra is seasoned politician and when he learnt that even the hardliner Mr.S.S.Mann has also come down and was going to temples,' and getting his forehead smeared with the saffron tilak to achieve his acceptability among the masses. More over it had been vindicated time and again that the Badal's approach was bearing fruits, Tohra also wished to 'modernise' himself. He had also experienced how his 'Amritsar declaration ' where he had attempted to form an anti- Badal front was reiected by the people through the elections that followed at Gidderbaha and elsewhere. .
On the other hand there were rumours of the poor health of Mr.Badal who is suffering fiom liver cancer, and had gone to USA for treatment. There are rumours that he (Badal) is clearing ground for succession of his wife as CM of Punjab. For Tohra it is now or never . He had to increase his acceptability among the Hindus. Had there been some sizable membership of Congress in the Punjab Assembly, it would not have been difficult for Mr.Tohra to raise the standard of revolt against the Badal successors because Mr.Tohra has always been preferred by the Congress. So much so once during the election of president of the SGPC the then Congress CM Mr.Beant Singh had campaigned for Tohra and his statement “Tohra is better than others' was denied by Ajit daily. Now thus there was need to create support in the BJP circles as well. lt was thus delibrate attempt by Mr.Tohra to visit the Nirankari Samagam at Patiala. The devoted Sikhs now feel that the prestige of the Akal Takhat will now be lowered as now the accused himself is the chief of,'the SGPC. Most people will agree with, us that no missionary activity is being canied out by SGPC. lt has confined itself to only Gurudwara management. Except a few books that too a few copies even literature publication is, avoided. The SGPC does 'publish a monthly Gurmat; . Prakash' a bland and drab journal does not touch' anything on which the Congressites and the 'saints' may get annoyed. lt has exclusive rights on the publication of Gurbani but then again the Gurbani literature is out of stock, more often than not. All that Mr.Tohra's management has been able to do is the construction of Gurdwara buildings. May be the other Sikh missionaries also know that it is in the construction of popular gurudwara alone where they are noticed. We are told that one baba Darshan Singh Delhi Wale started the :the historic house of Guru Nanak at Batala. Babaji abandoned the construction for the reason known only to him. Similar is the position of the remote gurudwaras. All thier activity is restricted to Golden Temple and Bangla Sahib. ln the absence of right kind of literature the' saints are 'carrying out publication of Gurbani and' writing and amending it the way it suits them. For example there is class of ' dera' or 'gurudom'of the Nanaksar brand 'who publish Gurbani gutkas and these are prefixed by imaginary stories 'the Guru was suffering from leprosy'. To start the process of amending Gurbani they have started sprinkling gurbani words, within it. All this has not come to the notice of Tohra's management. Obviously for the reason that they are least concerned about it. Mr.Tohra with hundreds crores rupees at his disposal is abolutely doing nothing to counter the activity of the sainst and sects who are flourshing with an alraming speed. Mr.Tohra is fully aware that there are about 300 deras/ saints/ guru with the active support of Congress/BJP, all these are active to absorb the sikhs in very sober manner. May be Tohra does not take them as a threat to the Sikhism. Now the opponents are carrying out intense preaching activity and the institution which is supposed to counter them do not do it as a matter of policy. Who then will defend Sikhism ? The Gurbani is opposed to ritualism and it believes in 'sehaj marg' the spontaneous way, but the practices which are going in the gurudwaras are full of rituals. Before the French revolution the priests there would issue certificates of heaven or luxury on consideration. Satirically that exacty is the 'position of the Gurdwaras today. As far as Tohra's management is concerned it also issues certificates. Sitting in Barmingham or Vancouver a 'modern' sikh can do or at least purchase the 'akhand path'. All that is required is he , has to send a cheque of the ' appropriate amount , i.e. sehaj path, akahand path or : ready made path. The'paths' are available at a price. lf you ' get the money, right from Harmander, a prayer will be made for you for enhancement of 'kirat kamai' . one's dubiously of its enhanced growth. During the long tenure of Tohra the only activity that is ,left is the mechanical recitation of Guru Granth Sahib for a price. They would not permit the other rituals that are prevalent. My friends say that as lar as money aspect is concemed he is not corrupt and does not embezzle, however, he allows its misuse by others. So much so it is learnt that before the present body of the ' SGPC all the members of the last body were alloted gurudwaras to make money through its properties. Thus all those members of the last body which survived for 20 years became millionaire. lt is Mr. Tohra's policy that he keeps the members happy so that his rule is perpetuated. 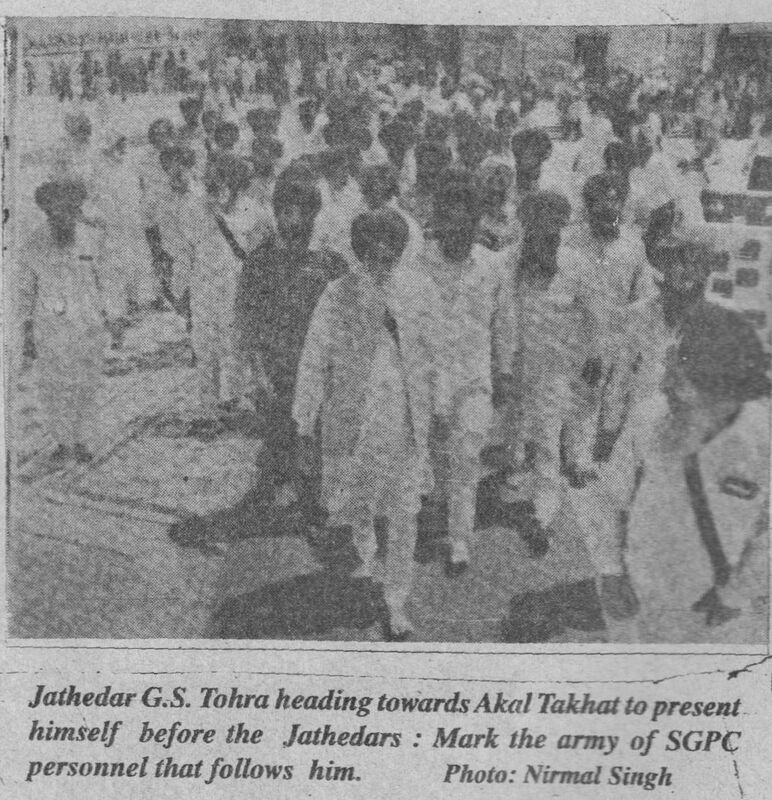 The Congress governments scared of the hot hands preferred Mr. Tohra at the helm and that was the reason that it did not conduct the elections of SGPC. We all know how pitiable is the condition of Sikh youth which is fully drowned in the intoxicants. When there was prohibition in the neighbourhood, Tohra never tried to influence the Punjab Goverment for some tightness on liquor consumption. Today the youth is turning to cap instead of turban which is strictly prohibited in Sikh code of conduct. SGPC' has not understood the gravity of situation and is' yet to launch some propaganda against the cap wearing. NO RADIO NO CABLES NO CHANNEL '- As we know the closing Years of the twentieth century is experiencing a revolution in communication technology. Despite their conservative approach the lndian governmrnt could not resist the private channels. As a result of which the Indian viewers have access to DD-1, DD2, HOME 'TV, STAR PLUS,BBC, CHANNEL V , MTV, STAR SPORTS, ESPN, ZEE TV, INDIA TV, SONY, DISCOVERY, NBC, MUSIC ASIA, ATN CNBC etc. Mr. Tohra's management have thus never bothered to facilitate the viewers atleast with the flow of Gurbani from'Harmander. That too at a time when there is no scarcity of money . The SGPC could have'started at least a cable : service ,for the viewers in Amritsar, Jalandhar, Ludhiana etc. All his activities are focussed on the political affairs. He holds a prominent position on the Akali Dal, when he is the head of the' SGPC, where was the need to become a member of the Rajya Sabha? Will he be able to do justice to his new assignment ? No, but Mr. Tohra wants to hold ''maxirnum influence so that his cherished aim of elevating himself to CMship is materialized one day.